When the original Mythic Oil launched back in 2011 I was all excited and absolutely loved that very first bottle I dragged into my bathroom. I had never used an oil in my hair before and even though I had my reservations to do so, the internet and all the great blogs I've been following for all this time got me on the bandwagon. Now about five years later, my hair oil game is still going strong. 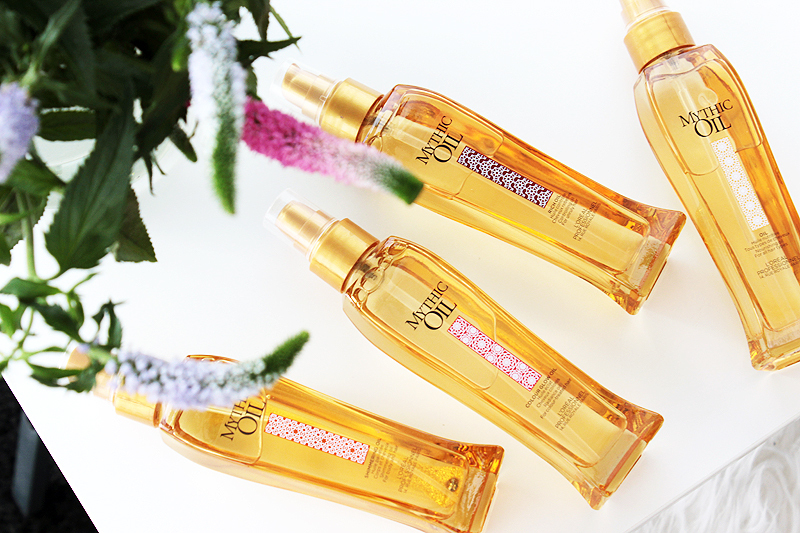 I use an oil nearly every day, particularly on the ends of my hair after styling and all over my hair on the night before I know I'll wash it - it's such a hair saviour! 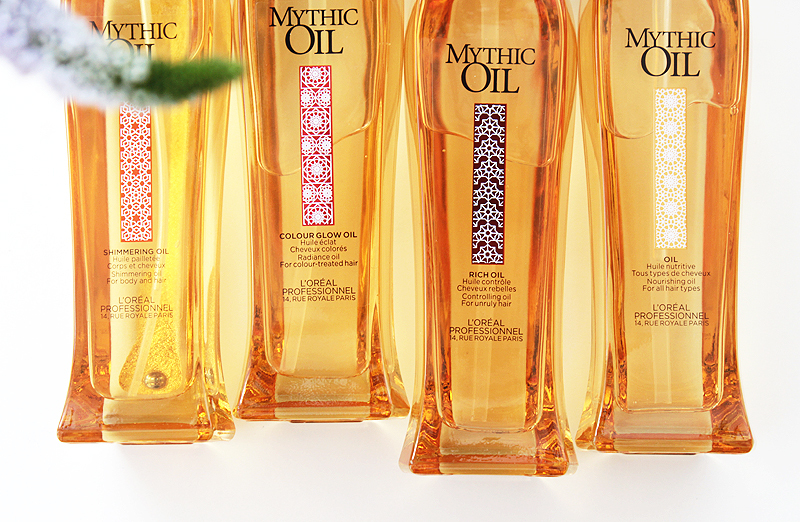 Mythic Oil got a bit of a makeover last September, right on time for its fifth birthday: the four existing Mythic Oils now come in a beautiful glass bottle. So pretty! ❦ Shimmering Oil: One of the newbies for Belgium, this one is the only one out of the four that doesn't contain any silicones. It's formulated with sesame seed oil & sweet almond oil and contains a fine golden shimmer. Give it a good shake before using it! You could also use this one for your body if you like. 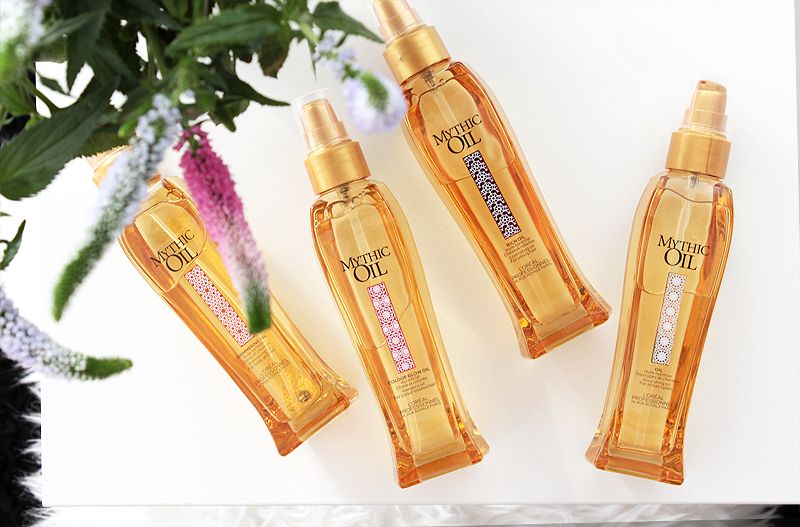 ❦ Rich Oil: Formuated with argan oil and rice bran oil, this one is formulated especially to tame thick & unruly hair. Contains dimethiconol. ❦ Mythic Oil: Made with avocado oil & grape seed oil, this is the golden oldie and suitable for all hair types and needs. Although there are more variations available, I'd just suggest to get this one as it does the job perfectly fine. Contains dimethiconol. I like to use these oils both on damp or dry hair. I find that adding an oil to damp hair after showering speeds up the blow-dry process, and adding a little on the ends in dry hair removes unwanted frizz. It also keeps them looking a little healthier and shinier, which is always a welcome treat! So you might ask.. Isabelle, why are you now mentioning whether hair products contain silicones? You never used to before? That's right. I never really used to bother - I used products formulated with sulfates and silicones and actually loved what they did. Silicones made my hair manageable, soft & sleek. But I got a little curious about banning both sulfates and silicones from my hair routine after reading a few blogposts about their benefits and more specifically their disadvantages. Either way, that's a story for another blogpost, as I've been asking you about your opinions on the topic. I am also researching a few brands you've never seen here before and got to ask some questions about how these ingredients work and what exactly they do. So for now I'm not going to elaborate, I've loved using these oils while I was still on the silicone path so still wanted to publish this post before I tell you all about my new hair habits.